I have concluded this is like a political battle... I see articles that say it does no good at all and I see restoration articles of 50 year old vehicles that have been disassembled with no rust on the bottom when there should be. The anti oil side says it isn't made to stick, it is environmentally bad because it does roll off on to the ground, and it really does no good because when it is off the rust can still attack. The other side claims with a thick coat of used oil and a trip on a dusty road about once a year your frame will not rust. Obviously the correct way would be to remove the frame, clean it, blast it and coat it with a product similar to the popular POR15 if not POR15. Man that is a lot of work! I know when I was younger and worked in a "gas station" we took the drained oil, saved it and used a big paint brush to apply it to our frames. It was just "what you did". I never kept any of those cars long enough to prove or disprove its effectiveness. Does anyone have any real data proving it helps or proving it harms? To be honest, I have never heard of this before. But I can see that it would be effective. Plenty of things in my profession come coated in oil to prevent corrosion. An oil coating will not just come off on it's own, it would need to be cleaned off. Usually with a cleaner of some kind, usually IPA. But applying it could be a pain nowadays couldn't it? And yes any spill would be considered toxic. In todays world I can't see this a valid option as I am sure that there are dedicated coatings that would be easier to apply and last longer. But I can see the logic behind the oil coating. I will not oil my frame, I just use rustoleum premium spray paint in flat black and keep re spraying as needed. I am ALWAYS upgrading, fixing, changing things on my truck so its nice to be able to touch it up with just a rattle can. I have had this bookmarked in my e-bay forever after doing some research, it is what I planned to use on the latest green truck. But you like the product or like a dude? I was swinging toward product before you said you use rustoleum. Have you used the magnet paint? Oh my gosh this made laugh!!! Many farmers have done this for decades using Fluid Film or used oil. They also coat their plow shares every year. Many also apply used oil to their entire corn head, on all moving parts. They've done it for what, more than 100 years now? I've also seen farmers coat various surfaces heavily with spray cans of dry moly lube to stave off surface rust. 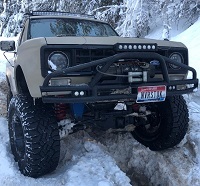 I know a guy in the next county that has a 1984 Chevrolet 3/4 ton 4x4 and crazy or not, he's always kept the underbody/inside the bedsides/frame coated with used oil and when the truck's not being used, he runs a small current through the back bumper with a ground rod at the front bumper. The truck looks like it just rolled off the assembly line, and he drives it in Illinois winters, albeit sparingly. The truck has zero rust on the body and the frame only has the most minor surface rust. I grew up on a farm 45 miles from the GA coast. Anytime we used the turn plow my dad would heat up some grease to liquefy it and use a paint brush to coat the shiny parts afterwards. We did the same for most of the other equipment. I like Magnet paints because they make chassis saver and Mostaliner, two excellent products I have used many times over the years. I have never met the "dude" lol just spoke with him on the phone. Chassis saver works awesome, its like POR15 but stays shiny and does not face in the sunlight, does not require more paint on top. When I used to work in the new car dealerships in the service department at times we would get in a vehicle that had a engine or trans leak that would coat a section of the under body or frame & living in NJ where they coat the roads in salt in the winter the sections of the under body or frame that were coated with the engine oil or trans fluid would not be rusted & what was bare was rusted. So I would say it helps prevent rust. Page processed in 0.1844 seconds (16% database + 84% PHP). 68 queries executed.